Boyds, Md. 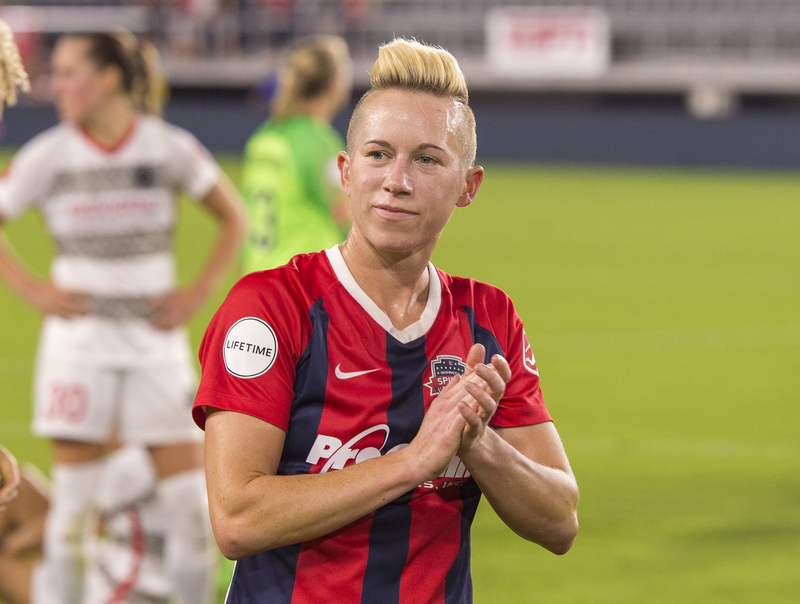 (4/8/19) – Washington Spirit midfielder Joanna Lohman has announced that she will be officially retiring from the National Women’s Soccer League and professional soccer effective immediately. The 36-year-old played professionally in the DMV and Philadelphia for over a decade. Lohman, a Maryland native hailing from Silver Spring, has nine caps with the United States Women’s National Team and began her professional career after a decorated four years at Penn State University. After graduating with honors in 2003, with no domestic professional league in place, Lohman spent time overseas until she was drafted by Saint Louis Athletica of the WPS during the 2008 WPS General Draft. Lohman did not want to leave the DMV, so she was then immediately traded to the Washington Freedom. Lohman first joined the Spirit in 2015 and played 17 out of 20 matches in her first year with the team. In the 2016 NWSL season, Lohman propelled the team to a championship appearance by playing in all 20 matches plus the playoff semifinal. Also in 2016, Lohman scored four goals which was good for second-best on the team that year. Her most spectacular goal came against the Boston Breakers, a bicycle kick in the 2016 season opener. In the first game of the 2017 NWSL season, Lohman suffered a season-ending ACL tear in the 11th minute but fought back through intensive rehabilitation to return at the beginning of the 2018 season fully healthy and scored the Spirit’s first goal of that season against Seattle. In the final game of 2018, Lohman was named the honorary captain of the Spirit. Lohman, while ending her career as a player, will maintain her relationship with the Spirit and DMV community. Lohman will be taking on a new role within the Spirit organization, concentrating on community outreach based on soccer’s power to discover and define one’s self-worth and beauty. Lohman will aim to inspire and create a more personal connection with fans, players and those who need help on their journey towards self-acceptance. Off the pitch, the Maryland native recently launched her own online course, “Define Your Beauty” and is a human rights activist, professional speaker and a Sport Diplomat, traveling the world to lend a hand in less developed nations to promote gender equality, conflict resolution, cultural understanding, and economic development. In addition, Lohman recently joined DC SCORES which is an afterschool development program that integrates soccer and off-field learning experiences to promote success for DC youth. The Washington Spirit invite all women’s soccer fans to join us when will be honoring Lohman on the club’s inaugural Pride Night on June 22 against the Houston Dash. Lohman’s time with the Spirit and her impact on the community will be recognized in an exciting manner on a very special night.